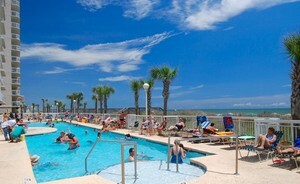 Crescent Shores Resort, located along the beautiful Grand Strand city of North Myrtle Beach, SC, offers incredible oceanfront accommodations in the heart of the area. 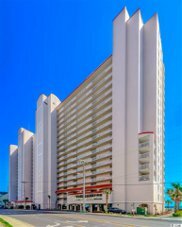 With 2, 3, and 4 bedroom condos with spacious floor plans and an amazing views of the Atlantic Ocean, you can bring your whole family and relax and enjoy the fun of the amenities offered. Some of Crescent Shores's fabulous amenities include an oceanfront outdoor pool, indoor pool, outdoor lazy river, wireless internet throughout the property, granite countertops, private balconies, gar, and covered parking. 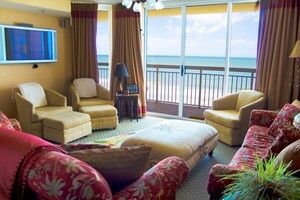 There is also a fitness room, two hot tubs, an indoor pool, and an oceanfront outdoor pool. 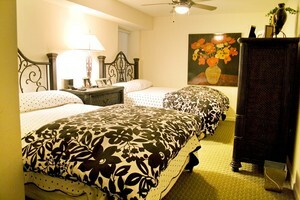 It's located near restaurants and fun activities for the whole family. As one of the most popular properties in in North Myrtle Beach, Crescent Shores offers some of the finest condo options available. Condo-World has an on-site office at Crescent Shores, and our main office is just a block away on 17th Avenue South. Also within walking distance is Molly Darcy's Irish Pub & Restaurant, a beach wear store and an ice cream/snack shop. Condo-World currently manages more than 60 units at Crescent Shores, and we highly recommend this property for those looking to buy due to its popularity among vacationers to generate rental income.